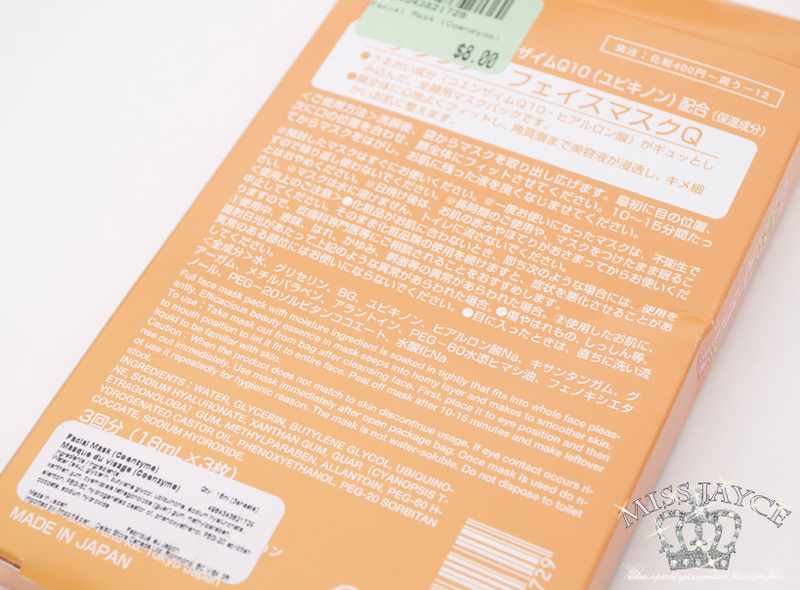 From the package, and some Japanese which looks like Chinese, it claims to be moisturizing and soothing for the skin. I purposely took pictures of the packaging, in case those who can understand Japanese can maybe translate and let us know more about it. On the package it says it retails for 420 Yen but my boyfriend paid $8 CAD plus tax = around $9 CAD for 3 pieces of masks. Basically doubled the price if he had purchased from the Japan Daiso store. I find that Vancouver's Daiso prices are way marked up. This is the mask after I was finished with it. Note that the nose area is too short. I couldn't cover the entire length of my nose with it :( Everywhere else, fits perfectly. This is the first time I'm trying skin care items from Daiso. Especially because there's minimal English translation, I barely know the benefits of this masks. I simply described all that I can understand or know in the description above. Out of the plastic package, the mask is wet but not dripping wet. There are minimal essence remaining in the bag. The fit is good where the width and the forehead area was perfect except for the nose area. It was too short, it never covered my entire nose. 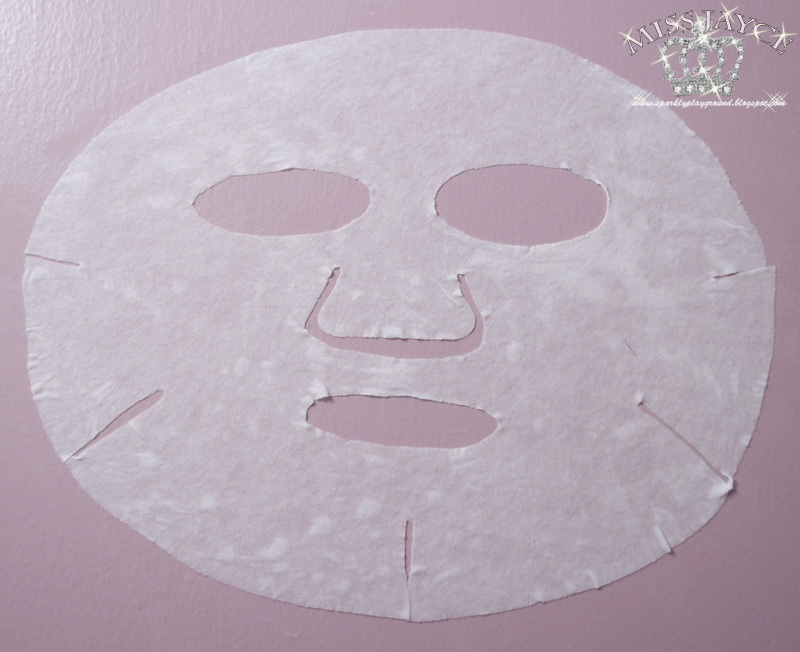 The texture was very similar the the KOSE Clearturn Mask here, it was very thin. I placed the mask on my face and within 10 minutes, i noticed that the forehead was getting dry while the cheeks, the nose and the chin areas are still very moist. By 15 minutes, other areas are slowly becoming less moist as well. At about 15-20 minutes, you should take the masks off. This is because if you took it off at 25 minutes, the mask is getting pretty dry and it starts to wrinkle up and sticks to your face. Thus the wrinkles of the masks slightly transfers to your face!! After I took it off at about 15-18 minutes, I gently massaged the remaining essence onto my skin. There's a bit of stickiness, but within 2 minutes of it it comes smooth. However, I did feel that the essence simply dried on my skin rather than being absorbed into my skin because I felt a bit tight and can feel every face muscle. Imagine a jello drying on your skin. It's very similar to that. It may be because the essence is Q10 thus it has "lifting" properties and thus I felt that tightness? 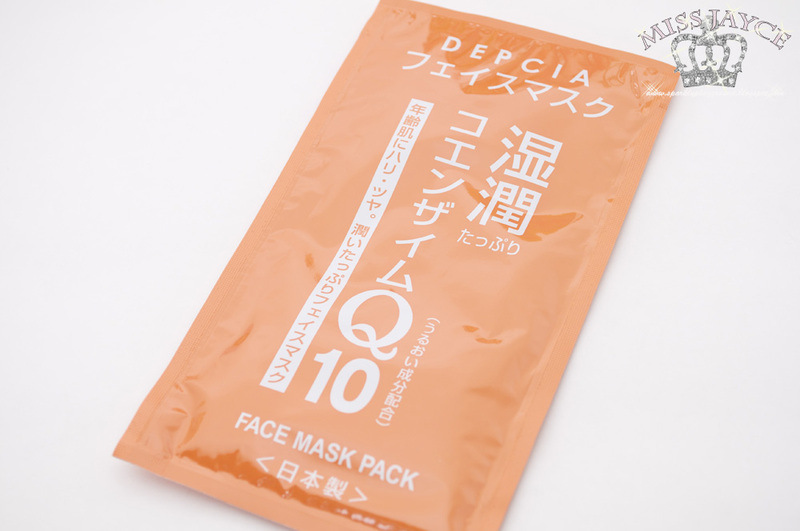 Not entirely sure because I've tried other Q10 masks before and it didn't feel like that. Overall, I didn't enjoyed my experience with this mask. I don't find that my skin has been moisturized or tightened in the right way. I've also never seen a mask dry within 25 minutes and can already transfer wrinkles. The morning after when I wash my face, I can feel the slimmy-ness being washed off. I don't see any difference to my skin with this mask. I don't recommend this mask and will not repurchase. Product: 1/5 ♥ Good enough if you're looking for a 5 minute mask, otherwise I don't like it for the reasons above. Packaging: 2/5 ♥ I expected a nicer packaging considering it is Made in Japan after all. It seemed like recycled cardboard box with poor designs. Price: 0/5 ♥ Doubled in Japan's retail price? uh, hell no. For the same price, I can get myself 10pcs of My Beauty Diary Masks.